Bernie Tiede was a good, god-fearing man, who went out of his way to please. His patient, caring manner was an asset as a funeral director, and his willingness to throw himself into small-town life made him beloved by his fellow residents of Carthage, Texas. So much so, that when it was revealed that Bernie had shot Marjorie Nugent four times in the back, none of the townsfolk believed him guilty. Oh, they knew he shot her dead, for sure. But they figured that someone as mean-spirited as Marjorie must have incited Bernie to take leave of his senses for a moment. Tragically for Bernie, prosecuting attorney Danny Buck knew full well that despite a full confession, four bullets in the back, and Bernie’s ample use of Marjorie’s money, he wasn’t going to get a conviction in Carthage. So he got the trial moved a mere 44 miles away to Saint Augustine, where Bernie's charismatic personality wouldn't get in the way of a fair verdict. The wonderful thing about Richard Linklater’s new fictionalized retelling of Bernie’s true story is that he allows us to fall in love with Carthage, its quirky inhabitants, and with Bernie himself. By the end of the movie, we can’t quite believe that any humane jury would convict Bernie, and sit in fear that those no-good inbred St Augustinians won’t do him right. Because this movie isn’t so much a character-driven crime drama as a Coen Brothers style love-letter to small-town Southern life. We luxuriate in the broad accents, marvel at the cast-iron certainty of the town gossips as they declare that Bernie FOR A FACT was or wasn’t this or that, and laugh at their incomprehension of Austin hippies. It’s hard to think of any recent use of faux-documentary talking heads that is as successful and hilarious as Linklater's use of the Carthage townsfolk – narrating, commenting on, and judging the story at each twist and turn. Because I warmed so much to these people, and started to identify so strongly with them, the movie turned from what could’ve been a real downer into effectively a rather heart-warming experience. On one level this was a movie about really nasty aspects of human nature – a man so wanting to be liked that he wills himself into an emotional prison, and a woman delighting in his pain. But rather than being brought down by the depiction of a bizarrely, horribly, sado-masochistic relationship (emotionally, not sexually, that is! ), I left the cinema positively full of faith in humanity. Because Carthage was a small town where ordinary townsfolk knew just what was what, and a good guy was a good guy, even if blighted by a sudden act of rage. All of which tells you that native East Texan, Richard Linklater, is pretty much in love with Carthage, and doesn’t really make much attempt to give a balanced view of Bernie. Or maybe he does, but the truth really is that Bernie was a good guy, despite the slightly suspect love of the high life to which Marjorie's money gave him access. By now, I’m so complicit in the “free Bernie” campaign I can’t even tell. All I know is that Linklater somehow managed to capture both the black humour and the tragedy at the core of Bernie’s need to please. I laughed a lot, I was fascinated, and I won’t soon forget the tale. Massive praise also to all three leads. 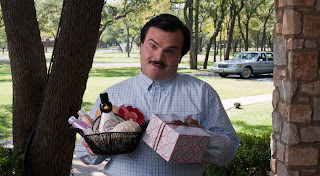 Jack Black gives a more modulated performance than is typical in his mainstream films, as the gregarious, needy Bernie. Shirley Maclaine as mean old Marjorie is just an acting masterclass. Look at the scene where she listens to Bernie sing a duet in a theatrical rehearsal, imagining him singing a love song to her. Her face shows a cynical old woman melting. And finally, you have to hand it to Matthew McConaughey, an actor who is brilliant in inverse proportion to his screentime. Banality in mediocre rom-coms turns into piquant cameos – first in TROPIC THUNDER, and now as the fame-hungry prosecutor Danny Buckland. BERNIE played Los Angeles and London 2011.